North Dakota topped the conference standings and claimed its eighth national championship, its first in 16 years. UND finished with an impressive 19-4-1 in the NCHC, including a pair of wins in two meetings vs. Miami, and ended the season 34-6-4 overall. A good portion of that NCAA title team will return for 2016-17, as the now-named Fighting Hawks will again one of the teams to beat in the NCHC. NCAA TITLES: 8 (1959, 1963, 1980, 1982, 1987, 1997, 2000, and 2016). COACH: Brad Berry (34-6-4, .818, 2nd season). 2015-16 RECORD: 34-6-4 (19-4-1 in NCHC, 1st place in the league). POSTSEASON RESULT: Defeated Quinnipiac, 5-1 in the NCAA championship. RINK (capacity): Ralph Engelstad Arena, Grand Forks, North Dakota (11,643). LAST SEASON VS. MIAMI: 2-0 (Nov. 13-14. ND 6-2 and 4-3 in OT in Grand Forks). ALL-TIME SERIES: North Dakota, 9-4-1 (.692). SCHEDULE VS. MIAMI: At North Dakota Jan. 13-14. In Oxford Mar. 3-4. TOP RETURNING PLAYERS: So. F Brock Boeser (35th overall pick by VAN), Jr. G Cam Johnson, F Rhett Gardner. KEY NEW FACE: F Tyson Jost (1st round pick, 10th overall in 2016 by COL). NOTES: UND has been consistent the past three seasons, finishing second, first, and first in the NCHC. North Dakota was led by NCHC rookie of the year – forward Brock Boeser – who paved the way in goals, racking up 27 in 42 games. The Fighting Hawks lose a clutch scorer in Drake Caggiula, who has graduated, as he mustered seven game-winning goals a season ago. Forward Austin Pogansk returns in Kelly green and white, having ranked in the top five on the team in points, lighting the lamp 10 times. The Fighting Hawks bring back two-time captain, senior Gage Ausmus, who didn’t find the back of net, however, Gage did provide 11 assist for UND. Junior defenseman Tucker Poolman was second among all blueliners with 24 points, scoring five goals paired with 19 assists. North Dakota looks the same in net, sending Cam Johnson between the pipes. In 34 games played, Johnson dominated with a 24-4-2 record with a 1.66 GAA with five shutouts. Tyson Jost adds depth to an already stacked UND lineup. The Alberta native was captain of Canada’s under 18-team. The 18 year old has top-6 level potential at the next level. UND lose scorers Drake Caggiula (25-26-51) and F Nick Schmaltz (11-35-46), as well as defenseman Troy Stecher and Paul LaDue. Still, the Fighting Hawks have 10 NHL draft picks on the 2016-17 roster. North Dakota will enjoy be returning 18 players from last season’s championship roster, including all four goalies. UND will be a tough opponent on any team’s schedule, as the Fighting Hawks are looking to return to the Frozen Four, which shifts to the United Center in Chicago. My name is Paul Lachmann, and I am very excited to join the Blog Of Brotherhood for my first season. I attended Ohio/Illinois Center for Broadcasting to get hands on experience in the field. I intern with Metro Networks, which allowed me to cover MLB games. I also work at Sacred Heart Radio as the Technical Engineer/Sports Director. I grew up in Cincinnati loving every sports team the city had to offer. I would go to the Cincinnati Gardens and watch one of the American Hockey League's best teams in the Cincinnati Mighty Ducks. I've gradually watch more and more hockey, whether it was on TV or if I was lucky enough, my big brother, @rednblackhawks, would take me to Miami RedHawks, first at 'The Goggin' and eventually Cady Arena. The atmosphere alone at those rink helped get me hooked to the sport I had rarely heard about growing up. 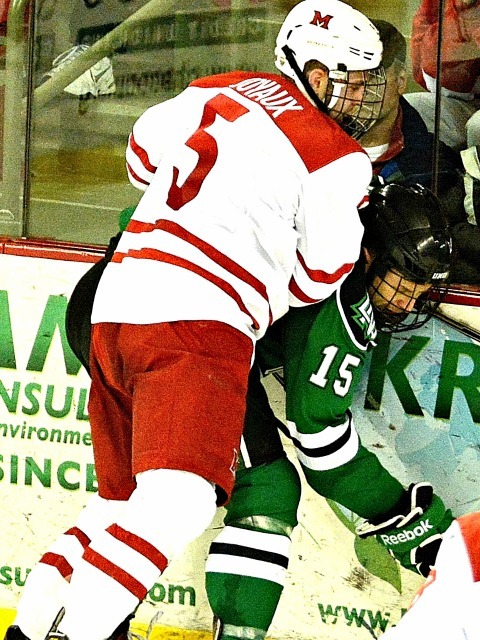 Now writing for the Blog of Brotherhood, I am very excited to spread that one-of-a-kind feeling that is Miami Hockey! Posted on September 24, 2016, in 2016-17 and tagged 2016-17 nchc snapshot, North Dakota Fighting Sioux. Bookmark the permalink. Leave a comment.